Blanche Phillips Howard (1908-1976), the second wife of John Langley Howard (1902-1999) is presumed to have accompanied her husband in 1951 (the year they married) when he lived most of the year in Mexico, including a spell in Ajijic. Blanche Phillips Howard. Untitled metal sculpture. Blanche Phillips was born in Mt. Union, Pennsylvania and attended Cooper Union, the Art Students League and the Steinhof Institute of Design in New York. She also studied at the California School of Fine Arts (CSFA), now called the San Francisco Art Institute. Blanche also studied with Ossip Zadkine. Sculptor Carl Mose (1903-1973) visited Lake Chapala several times in the 1960s, though it is unlikely that he was artistically creative during his visits. Mose in described in the Guadalajara Reporter (6 March 1971) as a “many time visitor to lakeside.” Thomas Parham Jr.’s book, “An Affirmation of Faith” (Xulon Press, 2011), suggests that Mose also lived for a time in Mexico City, though the precise details and dates are unclear. Certainly he visited Mexico City on several occasions since he had many of his bronze sculptures cast there. Carl Christian Mose was born in Copenhagen, Denmark on 17 February 1903, became a naturalized U.S. citizen, served in the U.S. Army Air Force during the second world war, and died in New Windsor, Maryland on 21 March 1973. The family emigrated to Chicago in the U.S. when Mose was seven years old. Carl Mose went on to study sculpture at the Chicago Art Institute, the Student’s Art League and Beaux Arts Academy in New York City. Interviewed in his studio in the farmland outside Westminster, Maryland, only a year before his death, Mose recalled that his teacher in fourth grade had urged the sculptor Lorado Taft to let him attend specialist classes. (Morning Herald, 18 September 1972). Mose subsequently worked with Taft for the next 15 years, but was also taught by Albin Polasek and Leo Lentelli. In his early twenties, Mose and his wife Ruth Helming traveled to Europe on the proceeds of a Goddess of Speed radiator ornament that he had designed on short notice for the Studebaker Corporation. On their return, Mose began teaching at the Corcoran School of Art in Washington D.C. During the next few years, he undertook numerous commissions in the capital, including statues and keystone carvings in the Washington Cathedral and more than a dozen seven-foot low reliefs on the Potomac Electric Power Co. building. Carl Mose, “Family Group” (1942). Maplewood, Missouri. Photo: Charles Swaney, Creative Commons. Mose’s newest work in St. Louis is “a 12-foot bronze of St. Francis of Assisi” in Forest Park, in close proximity to another of his sculptures, “Figure of a Young Boy,” a bronze drinking fountain. Mose’s sculptures can be seen in the Smithsonian Institute, and in federal and state buildings in Minnesota, Kansas, Missouri, Maryland and Washington D.C. They include that of Stan Musial outside Busch Stadium in St. Louis and a 21-foot bronze and granite piece, installed in 1958 for the Air Force Academy near Colorado Springs. This particular 21-foot bronze and granite piece, “Eagle and Fledglings”, was cast in Mexico, and accidentally dropped from a crane during installation. The minor damage that resulted had to be covered up during its unveiling. Other works by Mose include the carved stone sculptures, “Land” and “Communication” (1940), either side of the entry to the (former) Salina Post Office, and “Family Group” (1942), a wood bas relief in the Post Office of Maplewood, Missouri. Ronald Irwin Bruner. 1979. “New Deal Art Workers in Colorado, Kansas and Nebraska”. Thesis. University of Denver. Marlene Park and Gerald E. Markowitz. 1984. Democratic Vistas, Post Offices and Public Art in the New Deal. Temple University Press. The Clique Ajijic was a group of eight artists that existed as a loosely-organized collective in Ajijic for three or four years in the mid-1970s. Many of the photos of Clique Ajijic artists and their paintings were taken by John Frost, the artist-photographer who was a long-time resident of Jocotepec. The photo below (believed to be by Frost) shows several members of the Clique Ajijic, together with family and friends, at the opening of a show in Galería OM in Guadalajara in October 1975. If you can fill in any of the missing names, please get in touch. Melvin (“Mel”) Schuler (1924-2012) was a sculptor, educator and a co-founder of the Humboldt State University Arts Department. Shortly after commencing his distinguished teaching career in 1947 at Humboldt State University, he was one of six artists exhibiting at the Villa Montecarlo in Chapala in August 1949. The exhibit, entitled “Cuarta exposicion anual de pintura” (“4th Annual Painting Exhibition”) also featured works by Nicolas Muzenic; Tobias Schneebaum; Alfredo Navarro España; Shirley Wurtzel and Ann Woolfolk. Sadly, so far, we have learned nothing more about his time in Chapala. Schuler was born in San Francisco in 1924 and died at his long-time home in Arcata, Humboldt County, California on 20 May 2012. After attending Yuba College (1942-1947), Schuler studied at California College of Arts and Crafts (B.A., M.F.A. ), and the Danish Royal Academy of Fine Arts in Copenhagen (1955-1956). In the 1970s, the internationally renowned sculptor began to produce large abstract sculptures using old growth redwood carved into abstract forms clad in copper and fastened with bronze nails. Museums that acquired his work include the Smithsonian, Hirshhorn (Washington D.C.), Palm Springs, Phoenix, Oakland, La Jolla, Portland, Crocker Art Museum (Sacramento) and Storm King Art Center (Mountainville, New York). Schuler continued to paint, as well as sculpt, throughout his life; the walls of his Arcata home were adorned by his own paintings, displayed alongside art collected from his travels in Africa and India. What’s the connection between sculptor Mym Tuma, artist Georgia O’Keefe and Jocotepec? ZZzzz-other Comments Off on What’s the connection between sculptor Mym Tuma, artist Georgia O’Keefe and Jocotepec? American sculptor and painter Mym Tuma had her studio in San Pedro Tesistan, near Jocotepec, the town at the western end of Lake Chapala, from 1968 to 1973. Tuma, formerly known as Marilynn Thuma, has become an important figure in the contemporary American art world. Tuma was born 23 September 1940 in Berwyn, Illinois. She studied at Northwestern University in Evanston, at Stanford University in California and undertook graduate work at New York University. After university, she moved to Mexico, setting up a second floor plein air studio in San Pedro Tesistan to experiment with three dimensional works. This was a formative period in her artistic development, fostered by the support, moral and financial, of her mentor Georgia O’Keefe (1887–1986), the “Mother of American modernism”. Tuma first contacted O’Keefe, fifty years her senior, in 1964 when she was studying in Irving Sandler’s modern art seminar for postgraduates at New York University. Despite the age difference, O’Keefe and Tuma discovered they shared several common interests. O’Keefe, then living on a ranch in Abiquiu, New Mexico, bought one of Tuma’s early works, and the two women corresponded for a decade. (The story of this correspondence is told by Tuma at OkeeffeAndMe.com). “In the high plateau of southern Mexico, overlooking Lake Chapala, I painted in remote San Pedro Tesistan. In that village were only two vehicles: a red Firebird, and a paneled truck, until I arrived in 1966 in a Volkswagen bus. I rented a studio for $8 per month and worked with an assistant, 17-yr. old Cruz Robledo who I taught to drive. She suppressed her giggles learning how to control the VW on cobblestone streets, rumbling down a string of plastered, cracked and chipped adobes. Women like Cruz worked at home, sewing and cooking, but she had a streak of independence. She did not let people, or men subordinate her. She grew more confident, while working on my sculptures, sanding fiberglass to smooth curves. She helped me prepare my paintings. Her mother still scrubbed clothes on rocks at the edge of Lake Chapala, her Aunt Deodata partnered with another woman near my studio. Cruz respected my work. I tutored her to become as independent as I myself. In the Sixties, women lost children and we heard church bells tolling for them in my 2nd floor plein aire studio. Cruz crossed herself and whispered sad news. We’d rest to watch the peaceful blue haze over the distant mountains and breathe. We shared ideas sanding my shaped sculptured paintings, far from the conflict in Vietnam. I felt militant about my work, in that time and remote place, to quote T.S. Eliot, “to construct something upon which to rejoice.” Convinced that one day it would bolster women’s power and equality in the U.S.
Before I left, we strung a rooster pinata from the church to my studio, and invited mothers with babes, and small children. They filled the floor eating cake and cream. Women nursed babes in rebozos around us. Cruz decided to become a midwife to help reduce suffering she saw among her sisters. As difficult as living in Mexico was, its vibrant colors, forms of energy, and simple life inspired my organic principles. For centuries, rituals of planting and harvesting maize surrounded my studio. However my materials/methods were innovative and contemporary to the 20th century and beyond. The “black creation” was a fiberglass sculpture called Obsidian, which Tuma duly took north on her next trip to New Mexico. After her time at Lake Chapala, in 1974, Tuma toured New South Wales and Western Australia, painting and sketching as she went, before establishing her studio on the East End of Long Island, New York. She is widely recognized for her work in the category of organic minimalism, which is influenced by oceanic and coastal forms, such as beach pebbles, sand, sprouting seeds, and spiraling shell forms. Her “sculptured paintings” have been exhibited at many galleries, including Guild Hall (East Hampton), the Parrish Art Museum (Southampton village), and the Clayton-Liberatore Gallery (Bridgehampton), all in New York State. Tuma is a charter member of the National Museum of Women in the Arts, and lectured at the Brooklyn Museum in 1992. Examples of Tuma’s sculptured paintings are in the permanent collections of several museums, including the Hirshhorn Museum and Sculpture Garden, in Washington, D.C., the Cantor Arts Center at Stanford, Palo Alto, as well as in the private collections of Henry Geldzahler, Tipper and Al Gore, and others. Tuma has also written several art-related books, including The Sea, the Simplicity of the Sea, and Other Poems, (Come to Life Graphics, 1984) and Radiant Energy, Light In My Pastel Paintings (2005). Mym Tuma is yet another of the many famous artists who have found inspiration while at Lake Chapala, where the light, lake, people and scenery combine to stimulate creativity. In 1971, he may have been among the group of artists who exhibited on 15 May 1971 at a “Fiesta of Art”, held at the home of Mr and Mrs E. D. Windham (Calle 16 de Septiembre #33). Other artists on that occasion included Daphne Aluta; Mario Aluta; Beth Avary; Charles Blodgett; Antonio Cárdenas; Alan Davoll; Alice de Boton; Robert de Boton; Tom Faloon; John Frost; Dorothy Goldner; Burt Hawley; Peter Huf; Eunice Hunt; Lona Isoard; Michael Heinichen; John Maybra Kilpatrick; Gail Michael; Bert Miller; Robert Neathery; John K. Peterson; Stuart Phillips; Hudson Rose; Mary Rose; Jesús Santana; Walt Shou; Showaltar (? ); Sloane; Eleanor Smart; Robert Snodgrass; and Agustín Velarde. Sculptor Leonie Trager, presumed to be Austrian, lived and worked in the Lake Chapala area in the early 1970s. She held a solo exhibition in the Galería del Lago, Ajijic, in 1973, when she was living in Chula Vista (mid-way between Ajijic and Chapala). The catalog for that exhibition includes a brief biography stating that she had graduated from the Academy of Fine Arts in Vienna, Austria and had “worked with great sculptor Ivan Mestrovic” in Dubrovnik (Croatia, then Yugoslavia). She apparently held several solo shows in London, UK, and also exhibited in the New York area, while her works were prized by private collectors in the USA and elsewhere. Very few of her pieces have appeared at auction. Her solo exhibit in Ajijic opened on 22 April 1973 and was comprised of 32 works, mainly sculpted in clay, but also using willow, jacaranda, pink alabaster, yellow Carrara marble, Indian jade, mimosa and mahogany. Titles of pieces exhibited on that occasion include “Moondance”, “Snowflake”, “Sensuousness”, “Sleeping Boy”, “Flower Girl”, “Tzaddik”, “Satyr”, “Cleopatra”, “Flight” and “Despair”. Her “Mothers and Daughters” sculpture (see image below), reported to be 14″ in height and limestone, was also shown in that show. Leonie Trager: Mothers and daughters. Limestone. Exhibited in 1973. Georg Rauch was born in Salzburg, Austria, on 14 February 1924, and lived thirty years in Jocotepec, on the mountainside overlooking Lake Chapala, prior to his death on 3 November 2006. Rauch had an adventurous early life. His memoirs (translated from their original German by his wife, Phyllis), described his wartime experiences. They were first published, as The Jew with the Iron Cross: A Record of Survival in WWII Russia, only a few months before his death. The self-published book was reissued in February 2015 by mainstream publisher Farrar Straus Giroux, with the new title of Unlikely Warrior: A Jewish Soldier in Hitler’s Army. The memoirs are based on 80 letters sent home from the Russian trenches telling how Rauch, despite being officially classified as one-quarter Jewish, was drafted into Hitler’s army at age 19 in 1943 and sent to the Russian front. He was captured and spent 18 months in a Russian POW camp, where he contracted bone tuberculosis. After the war, Rauch spent two years recovering in Stolzalpe, an alpine sanatorium. Rauch studied architecture for two years and life drawing with Professor Bőckl at the Akademie der bildenden Kűnste in Vienna, and was encouraged by his mother to pursue a career as an artist. He was awarded travel scholarships by the Austrian government. He exhibited and became a member of the prestigious artists’ association, Wiener Secession, and soon was showing his paintings in Vienna, Paris, London, Germany and Scandinavia. In 1966 Rauch married his soul mate Phyllis Porter in Ohio. The couple, who had met in Vienna, lived briefly in New York before returning to Vienna in the winter of 1966/67, because Georg had been commissioned to produce the main sculpture for the Austrian Pavilion at the upcoming Montreal World Expo (1967). In summer 1967, the Rauchs, together with fellow artists Fritz Riedl and his girlfriend (later wife) Eva, spent two months driving through Mexico, as far south as Tehuantepec. On their return trip north, the group stopped off in Guadalajara to visit the Austrian consul. The consul, an architect, purchased several watercolors completed during the trip, as well as 4 or 5 oil paintings that Rauch had with him. In the fall of 1967, the Rauchs returned to Guadalajara when the consul commissioned a sculpture for a shopping center being built in the city. The Rauchs remained in Guadalajara until 1970. In 1968, Rauch was invited to do a series of posters for the Guadalajara Committee of the 1968 Mexico City Olympics. (Mexico City had commissioned its own Olympics posters, but Rauch was responsible for all the posters produced in Guadalajara). One of these Olympics posters is mentioned in Al Young’s novel Who is Angelina?, during a description of a living room in Ajijic. Another Rauch poster (not of the Olympics) would later feature in the movie 10 (1979) starring Bo Derek and Dudley Moore, shot on location at the Las Hadas resort in Manzanillo. And yet another Rauch poster was once shown in an episode of the TV series Ironside. 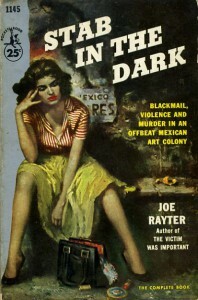 It was during their stay in Guadalajara, that Rauch first met artist and photographer John Frost, who had a studio in Jocotepec and would later introduce Rauch to some of the finer points of silk-screening. His clown-faced self-portraits bored deep into his soul. The influence of Lake Chapala was clear in many of his haunting and sensuous Mexican landscapes. On the other hand, his watercolors revealed his particularly keen sense of observation and his delicate touch. (Of course, I’m biased because I chose a Georg Rauch watercolor of Ajijic as the cover art for my Western Mexico, A Traveler’s Treasury, first published by Editorial Agata in 1993). Georg Rauch was a consummate professional artist, one who was sufficiently successful throughout his career to live by his art alone. In conversation, he would sometimes interject a truly outrageous statement, but his wry sense of humor masked a considerable political perspicuity and an intense desire to interrogate the world around him. In the 1980s, Georg and Phyllis Rauch expanded their home and opened the Los Dos Bed & Breakfast Villas, where Phyllis continues to welcome visitors, especially those with an interest in her husband’s art. 1952 Konzerthaus in Vienna (first solo exhibition); and the Kűnstlerclub, Vienna. 1953 to 1968 : London; París; Stuttgart; Vienna; Dusseldorf. ???? Guadalajara (Galería Vertice) year-long traveling show, called Austrian Artists in Mexico, including works by Rauch, Fritz Riedl, Ginny Riedl and others. For more images of works by Georg Rauch, see Georg Rauch: Artist in Mexico gallery. David and Helen Morris were well-known potters who lived for several years in Guadalajara and Ajijic in the late 1940s and early 1950s, before moving to the San Francisco Bay area of California. David Morris was born in 1911 in Washington D.C., where his father was a doctor at Walter Reed Army Hospital. Morris graduated from Georgetown University and was then employed in the city to head the arts section of the Work Projects Administration, a New Deal program, in the 1930s. This is when he first met Helen, a dance student. The couple married in 1937, and spent their honeymoon in Mexico. During the second world war, Morris served in the U.S. armed forces in Europe and the Pacific. After the war, they returned to the Washington D.C. area for a short time where David Morris studied at the Institute of Contemporary Arts, presumably on G.I. Bill funds. He transferred his G.I. Bill tuition for a Masters degree in Fine Arts to the University of Guadalajara and the couple moved to Mexico in the late 1940s. (Their son Nicholas was born in about 1949). David Morris had several works – one tempera, one watercolor, one monotype, and four ceramic pieces – included in the end-of-academic-year exhibition at the Fine Arts school of the University of Guadalajara in June 1951. David Morris: Railroad Station at Lake Chapala. 1950. The family subsequently settled in Ajijic (they were definitely living there by mid-1951), where they became active members of the area’s growing artistic colony of the early 1950s. At this time, David was better known as a painter, though the couple were beginning to develop their extraordinary skills as potters. Among his Mexican paintings is an oil on board, entitled “Railroad Station at Lake Chapala”, dated to 1950, which was sold at auction in California in 2009. While in Ajijic, the couple were good friends of black American painter Ernest Alexander (“Alex”), who ran the Bar Alacrán (Scorpion Bar) in Ajijic. Alex, his common-law wife Dolly and their son Mark, moved to the San Francisco Bay area at about the same time as David and Helen Morris did. The couple returned to California in 1953, where they became political activists and began to work together as potters. Living and working initially at 701, Humboldt Street, David and Helen Morris began to produce exquisite ceramic pieces that quickly gained national attention. David Morris was active on the committee behind the Sausalito Art Festival, held in November 1956, on the Casa Madroño grounds, and even performed as a singer at that festival. He continued to be actively involved in organizing several other Sausalito Art Festivals, including those held in May 1957, October 1957 (which drew record crowds of almost 20,000 over three days) and June 1958. In June 1957, Morris was the spokesperson for a group of 60 freelance artists who objected to the regulations imposed for exhibitors by the organizers of the annual Marin Art and Garden Show, which, despite receiving public monies was open only to paid-up members of the Marin Society bf Artists. The freelance artists argued that entry should be open to all regardless of whether or not they were members; their petition was upheld by the Marin County Board of Supervisors. And they’ll have to burn the boatyard down to get that glaze again. Undeterred for long, David and Helen Morris soon built a new studio in Larkspur, where they would go on to craft more than 10,000 pieces of stoneware and porcelain, some of which found their way into the permanent collections of the Smithsonian Institution, the Everson Museum of Art in Syracuse, New York, and other museums. The couple worked closely together and shared a single wheel in their studio. A contemporary account says that while David worked on the larger pieces, Helen crafted the smaller, more delicate forms. According to art critic Tom Albright, David Morris was particularly adept at creating “rich, lush glazes”, based on ancient Chinese techniques. David and Helen Morris and their work were regularly featured in ceramics-related magazines of the 1950s and 1960s. For example the April 1960 issue of Ceramics Monthly had a photograph of the couple at work in their studio on its cover, and an illustrated 3-page feature article about them and the “crystalline” stoneware glazes they had developed. Despite their aversion to taking part in juried shows, their stoneware won numerous awards, including a first prize in the Berkeley Art Show in July 1957. In April 1958, David Morris was invited by the Artist League of Vallejo to highlight the official opening of their new building in Vallejo. Helen Morris (born 24 February 1917) died on 6 December 1992, aged 75 years; David Morris died on 26 January 1999, his 88th birthday. Design Quarterly. 1958. “Eighty-Two American Ceramists and Their Work” in Design Quarterly 42-43. Malvina Reynolds. 1960. Little Boxes and Other Handmade Songs. Sausalito News: 28 September 1956; 2 November 1956; 9 February 1957; 22 June 1957; 29 June 1957; 6 July 1957; 24 August 1957; 26 October 1957; 18 January 1958; 5 April 1958. Stephen Schwartz. 1999. Obituary “David Morris“. 25 February 1999.